Credit: Jeff Schmaltz, MODIS Rapid Response Team. April is in the middle of the dry season, which runs from January through May in this region, and naturally coincides with fire season. Farmers often use fire to return nutrients to the soil and to clear the ground of unwanted plants. Fire helps enhance crops and grasses for pasture. Some of the fires in this image may be wildfires, with natural (lightning) or accidental (human) sources. As the dry season progresses, the number of fires tend to grow, as does the blanket of smoke which settles over the land, and although the fire may help the farmers get their lands ready for planting season, unfortunately, the fires also produce smoke that degrades air quality. This natural-color satellite image was collected by the Moderate Resolution Imaging Spectroradiometer (MODIS) aboard the Terra satellite on April 24, 2014. 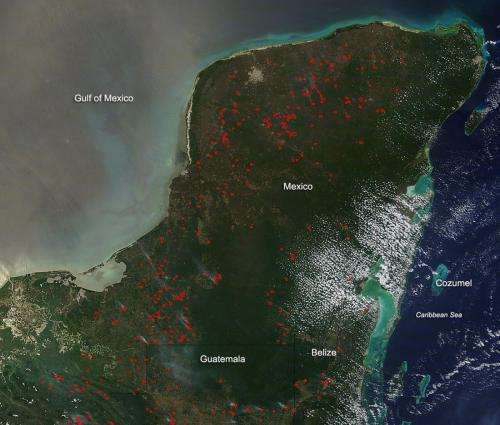 Actively burning areas, detected by MODIS's thermal bands, are outlined in red. Each hot spot, which appears as a red mark, is an area where the thermal detectors on the MODIS instrument recognized temperatures higher than background. When accompanied by plumes of smoke, as in this image, such hot spots are diagnostic for fire. Image: Prescribed fires abound in Southeast U.S.